In family child care homes, providers care for small groups of children in a residential building. Often this type of care has one or two caregivers and may offer non-traditional hours. Not all family child care homes may be required to follow a set of minimum health and safety requirements. It is always important to ask your family child care provider or check with your local Child Care Resource and Referral agency to check to see if your provider is required to be licensed. Family child care homes also may be classified as a large or small family home, depending on the number of children in care. The home-like environment is appealing to many families. Family child care providers care for fewer children at one time. Siblings can be together because most family child care homes have different ages of children enrolled. There are fewer adults that may care for your child on a daily basis. Family child care homes may be more flexible with their hours of operation compared to other types of care. You may want to check to see if your family child care provider participates in your state’s Quality Rating and Improvement System. Ask to see a copy of the program’s license and inspection history. These reports provide you valuable information about the provider’s health and safety compliance. Click on State by State Resources to find out more information on licensing and inspection reports in your state. Confirm that every adult living, working, or volunteering in the child care home has had a comprehensive background check. Ask the provider about the number of adults and children present (staff to child ratios). If you are looking for infant care, make sure to ask your provider about their Safe Sleep policies. For more information on questions to ask your family child care provider, see our Family Child Care Home Checklist. Child care centers often group children by age and are generally operated out of non-residential, commercial buildings. Centers are larger and enroll more children with a dedicated director and numerous staff members. Some child care centers operate as non-profit and may be owned by an individual, church, public school, or a government agency. Other child care centers may operate as a for-profit and may be owned by an individual or a chain. It is always important to ask your child care center or check with your local Child Care Resource and Referral agency to check to see if your provider is required to be licensed. You may also want to check to see if your child care center participates in your state’s Quality Rating and Improvement System. Child care centers have a classroom-like environment where children are cared for in groups of other children typically their same age. Child care centers have more adults present in the building. Child care centers offer a variety of activities and opportunities for children. Child care centers often have the most regulations and inspections for health and safety standards. Confirm that every adult living, working, or volunteering in the child care center has had a comprehensive background check. If you are looking for infant care, make sure to ask your provider about their Safe Sleep policies. For more information on questions to ask your child care center provider, see our Child Care Center Checklist. Preschool programs are typically offered for children ages 3-5 years old. Preschool programs may be offered through a school, faith-based organizations, non-profit organizations, and child care centers. Families choosing this type of care may not need a full-time program but may be looking for a program that focuses on school readiness. While some preschool programs may operate on a full-day, year round schedule, some may not. 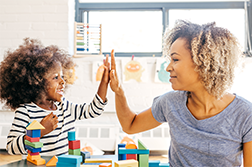 It is always important to ask your preschool provider or check with your local Child Care Resource and Referral agency to check to see if your provider is required to be licensed. You may also want to check to see if your preschool program participates in your state’s Quality Rating and Improvement System. Confirm that every adult working or volunteering in the preschool program has had a comprehensive background check. For more information on questions to ask your preschool provider, see our Preschool Program Checklist. 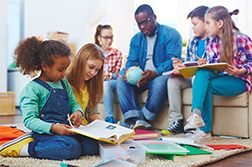 School-age programs typically provide child care during the before- and after-school hours. They may also offer care during school holidays and summer break. Different options for school-age care may exist in your community. Local schools may provide care during the before- and after-school hours and may contract with an outside provider such as the YMCA or Boys and Girls Club to offer this type of care. 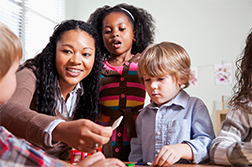 Some family child care providers and child care centers also offer school-age care. Other programs, such as parks and recreation departments, community-based programs, and churches may offer this type of care as well. It is always important to ask your school-age provider or check with your local Child Care Resource and Referral agency to check to see if your provider is required to be licensed. You may also want to check to see if your school-age provider participates in your state’s Quality Rating and Improvement System. Ask the provider if they offer care during times of school closures due to weather. For more information on questions to ask your school-age provider, see our School-Age Program Checklist. If you’re considering asking a family member or friend to care for your child, or if you’re thinking about hiring a babysitter or a nanny, you can learn about Family, Friend, and Neighbor Care here.